The Arizona desert is lovely in August. If you’re not green and prickly it’s like standing in the bottom of a volcano hoping your SPF 15 will do the trick. So how does Simone Greevey, a twenty something e-zine editor from San Francisco wind up wearing a duck costume in sweltering Seepwillow, Arizona? 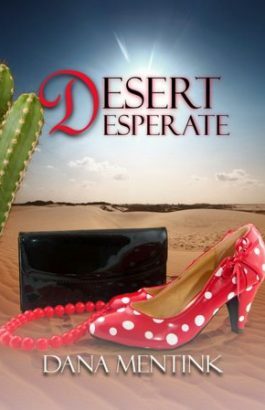 In Desert Desperate, Simone loses her job and her fiancé in one fell swoop and runs to the arms of her eccentric aunt, owner of the Ruddy Duck trailer park, a hundred miles from nowhere. There she meets Chaz Tagliola, a guy who doesn’t know Jimmy Choo from Jiminy Cricket, a man with a passion for God and the one thing Simone has tried to forget about for the decade since her father’s death. Before her suitcase is unpacked; Simone’s aunt disappears, leaving Chaz and Simone to lead a five day junior high school Bible study camp. Bug lightings? Hot dog roasts? Cactus jam recipes? It’s a whole new world for a San Francisco girl. Throw in a mysterious park tenant and a breathtaking natural discovery and the stage is set for Simone to learn a divine lesson that will rock her world in a big way.